I only found out I was coming to see King Gizzard and the Lizard Wizard an hour before they come on stage tonight. No time for a shower – throw on an unwashed tee and out to the Albert Hall in a matter of moments. To say i’m frenzied is an understatement and it’s a frenzy that continues from the moment the Aussie psych rockers start until they end. Opening their set with ‘Rattlesnake’, the first track from their new album Flying Microtonal Banana, the crowd is instantly sent into a possessed hyperactive pit. Their two drummers tirelessly pound along in sync, creating a pulsing energy which is reciprocated by tonight’s crowd. Lead man Stu Mackenzie has to crouch down to the herd of bodies at the front to presumably tell them to calm down. No such thing happens though, energy is high throughout. Before long they’re into ‘Billabong Valley’, a personal favourite off their latest release. Kenny Ambrose takes lead vocals on this track as the Wizard Lizard swap instruments and places on stage. With the Western-style looping guitar riff, it’s a tune that wouldn’t sound out of place soundtracking a Quentin Tarantino movie. For a band with a more than frequent output, the number of fans that scream every word back towards the stage all night is impressive: the new album only came out this year after all. Mackenzie picks up a 12-string for ‘Altered Beast’ and for the first time things slow down and go a little quieter at the end of the track. ‘People Dodgers’ follows and the usual craziness resumes. The band has an odd way of sounding loose and tight all at once, it’s certainly a distinctive sound they have. They end with the three-part epic ‘The River’. 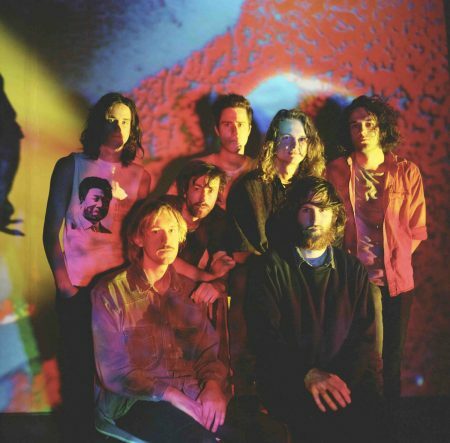 You wouldn’t be blamed for thinking King Gizzard have played way over thirty songs in tonight’s set, but with the tempo and key changes they are famous for, each track can last ten minutes or longer. It’s been a pleasure to watch, and finally I have a sobering moment as they leave the stage. Truth is though, I don’t really want the frenzy I’m in to end.